Birju Shah is currently a Group Product Manager at Uber Technologies LLP. He leads the product group for the sensor inference & vision platform teams at Uber. 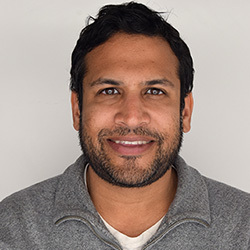 Prior to Uber, Birju was a product lead at Climate Corporation where he led the Yield Analytics team. Birju is also a board & product advisor to several start-ups, fortune 500, and venture capital firms. Birju draws upon 15 years of building enterprise and consumer products that are used by over 1+ billion users daily in 190 countries. His product focus is on machine data, machine learning, and artificial intelligence platforms for consumer & enterprise use cases. Birju hopes to work with students that are eager to achieve scale and see ideas to execution either as product innovators in large organizations or as an early stage founder. His philosophy is to teach product strategy, product planning, and product management through a case-based approach. The goal of the class is to differentiate from the entrepreneurship classes offered by teaching you and your team to build an excellent product for your customers, as a predecessor to launching your full venture.